3rd December 2004 marks the completion of 20 years of the Bhopal Gas Tragedy, the world's worst chemical disaster in which more than 20,000 people were killed. The tragedy occurred when 40 tonnes of Methyl Isocyanate (MIC) leaked from the pesticide facilities of the Union Carbide Corporation located in Bhopal. 8000 people died due to direct exposure to the toxic gases by the third day of the leak. The gases that leaked not only burned the tissues of their eyes and lungs but also poisoned their blood stream and other internal organs. Many who died did not even know what hit them as they suffocated to death on their beds while others went running out on to the streets, gasping and fighting for breath, and eventually fell down dead. Even till today, doctors speak of the two to three thousand people being treated, year after year, from the chronic problems resulting from the inhalation of these poisonous gases. Children born after this tragedy also continue to suffer and the terrible list of ailments range from respiratory, digestive and menstrual disorders to cancers and stunted growth. Union Carbide, which merged with Dow Jones in the year, 2001, has neither taken firm responsibility nor been able to answer the questions related to this horrific tragedy. It still remains a mystery as to why the company adopted two sets of standards while putting up their factories. 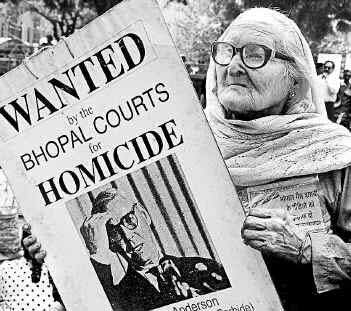 Whilst their operations in the American state of West Virginia had an advanced computerized system in place, the facility in Bhopal was outdated to say the least. Faulty and defective refrigeration and valve and vent lines had been left unattended for a period of two years when the disaster took place. Also, the amount of MIC stored in West Virginia was 5000 gallons as compared to the 30, 000 gallons that had been piled up at Bhopal. Local authorities were also kept in the dark about the dangers of an MIC leak leave alone the matter of making provisions for antidotes. There is a case pending against the corporation on the charges of death, not amounting to murder though the above facts point clearly to a culpable offence. Why should Union Carbide have taken such great care to protect its American plant and shown so much indifference to its plant in a developing country like India? Is it because life is very cheap here or that some countries (read America) are more equal than others? When the horrific attack on the twin towers of the World Trade Centre happened, the whole machinery stepped into place to minimize the damage. Subsequently, the innocent people of two countries paid and continue to pay with their lives for links with regimes suspected (proved as false in the case of one country) to be involved with the September 11th bombings. In the case of the Bhopal tragedy, there was nothing done to prevent a disaster that was waiting to happen nor to help those affected. This is ample proof of the gross negligence of Union Carbide and yet America stood by the Managing Director of the company and did not permit him to be tried in India. Isn't this is a terrible case of double standards' just one more in the list that the world's only superpower practices? One more instance of Do as I say, not as I do. It is not as if the Indian and Madhya Pradesh governments are not to blame for what has happened. They still have no plausible explanation to offer for how no survey was done before permitting 30, 000 gallons of MIC to be stored in a plant in the heart of the city of Bhopal. Even the results of tests conducted on the people of Bhopal, by the Indian Council of Medical Research, are being kept under wraps. Just like with the inhabitants of Hiroshima and Nagasaki, many genetic mutations would have occurred with these hapless residents and the impact will probably affect many more generations to come. Tragedies like Bhopal, Chernobyl and Hiroshima and Nagasaki are warnings of the hazards posed not just by chemical pesticides but also chemical and nuclear weapons and their anniversaries serve as reminders of the horrors, lest we forget. In an inter-connected world, it is sheer foolhardiness on the part of the countries from the North to think that they are safe from the Frankensteins (be they biological, chemical or human) of their own making. History, as recent as 9/11, bears testimony to this fact and one can only hope that those who fancy themselves to be the puppeteers who have the world on a string, will learn something from it.